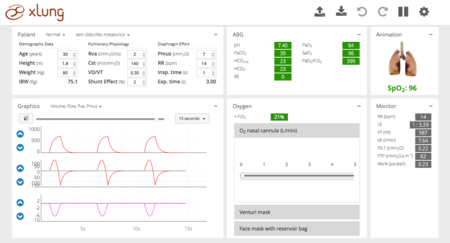 This simulator aggregates oxygen therapy administered through multiple devices and their immediate physiological effects, the ability to simulate many of the most common clinical scenarios of respiratory failure (such as COPD exacerbation, asthma crisis and pneumonia among others) as well as metabolic disturbances. The simulator works on the following operating systems: Windows XP, or higher, as well as Mac OS X 10.9.4 (Mavericks) or higher and requires an internet connection. For the best experience we recommend the latest version of the following web browsers: Google Chrome, Mozilla Firefox or Safari. We are also working on a mobile version.